Fitness has become a venue for supporting great causes, whether it’s a local five or 10 K run, or a nationally-recognized marathon. This past weekend, it was the American Odyssey Relay, sponsored by Fitness Together® (FT) studios in the Washington D.C. area, in support of our troops. 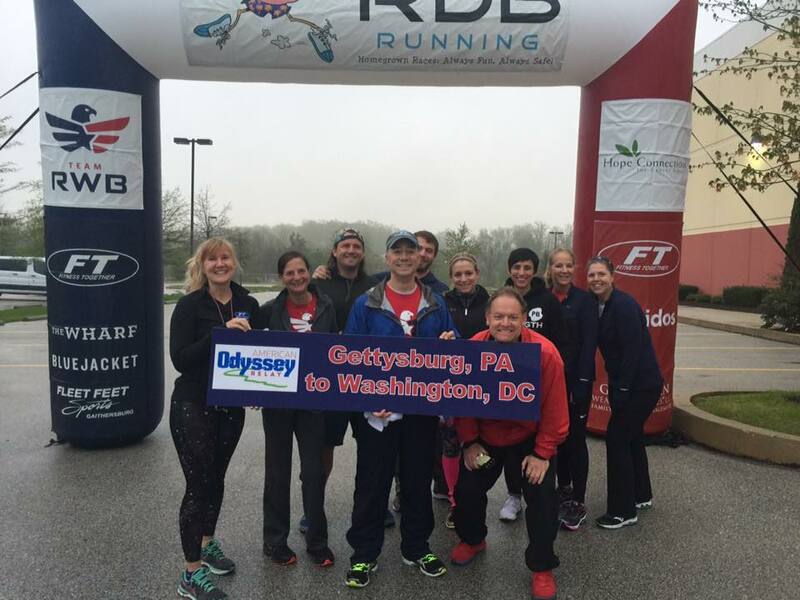 Under the leadership of Rick Coe, owner of FT studios in Bethesda and Potomac, The American Odyssey Relay is a 200-mile trek that begins in historic Gettysburg, Penn., and ends in the Nation’s Capital of Washington D.C. The relay raises funds and awareness for several charities, including Team Red, White and Blue (Team RWB), a non-profit supporting veterans returning from active-duty and whose mission is to enrich the lives of wounded veterans and their families. The 2016 American Odyssey Relay marked the sixth year that Rick and his fellow FT studios ran the race. Taking the time to support a cause, and run a 200-mile relay race is more than just a weekend commitment. For each of the participants in the relay race, they are driven by the cause, setting new fitness goals, banding together and having fun. In addition to Coe’s studios, FT studios in Georgetown, Fairfax, Va. , East Greenwich, R.I. and South Park, N.C. were represented as part of Team FT. For Stacy Adams, who owns the Georgetown Fitness Together®, it was her studio’s first time and she was thrilled to be a part of the team. While any day of any month is a great time to support the American Military and the veterans who served our country, the FT team says the timing is perfect leading in to Military Appreciation Month. The cause is particularly significant for Coe, who is a graduate of the United States Military Academy at West Point and a former Army Officer. The team has set up an online opportunity for anyone interested in donating to their cause, with a $5,000 goal. Fitness Together® thanks all the men and women who have served and are serving our country, and are honored to recognize them as part of National Military Appreciation Month.